In eighteen volumes The Empirical Economics Letters (EEL) has been able to publish contributions from over 250 institutions of 100 countries spread over six continents of the world. The EEL team is grateful to all contributors and well-wishers for their outstanding response and support. Click here for a glimpse of the World of EEL [Clickable Map] [PDF list]. 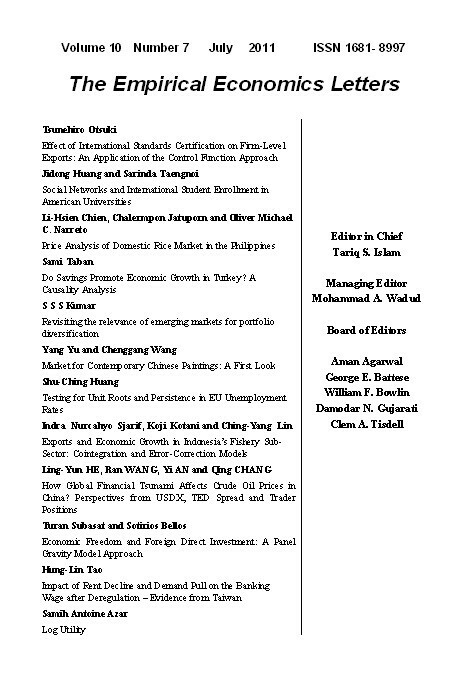 The Empirical Economics Letters (EEL) is a fully refereed international journal. The EEL invites papers on all aspects of empirical economics. There is no specific deadline for submission of papers. Papers can be sent any time and will be considered for the subsequent issues. All papers must have an empirical content and the theoretical models on which the empirical results are based should be clearly, but briefly, stated. The EEL is published each month, that is, twelve times a year. The EEL is listed in the American Economic Association (AEA) electronic indexes, which are included in JEL on CD, e-JEL, and EconLit. It is also included in Cabell�s Directory of Publishing Opportunities in Economics and Finance. The EEL is further included in ABDC journal quality list.